I’ve managed a couple of trips to prime trout country, despite being a bit under the weather. I’m trying to get at least one trip to the mountains in each week, and one or more local “sessions”. As I have stated before, I am mostly a hike-in fisherman, and the longer day lengths help with that. I’m really enjoying fishing with plugs, and am finding that I am catching more brown trout than I have in the past. That is in waters that hold both rainbows and brownies. 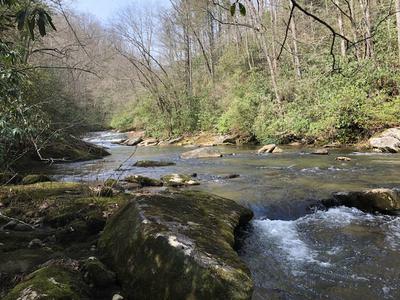 Because I have to travel a bit to reach trout waters, I am not generally on the water early, or later when brown trout are more active. So it seems like plugs are enticing enough to get some movement from a fish that is notoriously shy during bright midday conditions. I’m slowly building my JDM plug supply to give myself some variety, and size options. I have found the Duo Spearhead Ryuki 50S "Wakasagi", and the Daiwa Silver Creek 44S "TS" both very effective. The Tennessee Shad color of the Daiwa and the Duo Spearhead Ryuki 38S are what I have caught 90% of the brown trout on. These Japanese lures cast great, sink quickly, and have such natural looking movement, that I have abandoned my smaller Rapalas for stream fishing. They will always have a place in my still-water box, but just aren’t as effective in moving water. I’m keeping my Yo-Zuri Pins Minnow in for now. I like fishing them, they cast fine, and the movement seems enticing, but they aren’t producing for me. That’s it for now. I will give another update down the road, to see how things are progressing. I know two of the photos are not oriented properly. I will fix them when I can. I’m not exactly sure how that happened. I am still honing my photo editing process. Was wondering what type of retrieve is working best for you, the twitching method imitating an injured minnow or a straight retrieve type? When watching Angler Saito and other Japanese BFS videos they most often seem to use the twitching(what I call it) by using the rod tip movement or a stop/reel/stop method of line retrieval. Guess it causes the plug to dart, then sink, then dart again, etc. Sort of like that of a dying minnow. I'm intrigue about your trout fishing opportunities? Didn't think SC would have any. Are they in the Appalachian Mountains of far west SC? We are still at least a month away from being able to trout fish-still lots of snow on the ground and streams iced over. I vary my retrieves based on nothing other than feel. I don’t think I have ever just reeled the plug straight in, without a pause or twitch. In current, I feel as though I would hang up more on the bottom if I didn’t twitch it fairly often. These Japanese plugs get down fast, so you have to be ready to retrieve quickly, depending on the depth you are fishing. When fishing ponds for bass, I will vary my speed more often. I have felt bass harassing the plug for a while before actually hitting it. I tend to slow it down and "let them have it" as I was told when I was a kid. 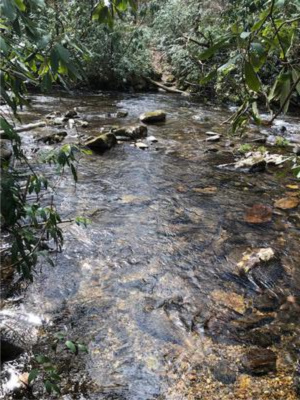 South Carolina has a surprising number of trout streams, all within the three northwest most counties. The exception being a tail race in the center of the state that actually has some unexpected natural reproduction going on. The Blue Ridge/ Southern Appalachian mountains transition into the foothills in upstate SC., and Georgia. Elevations along the escarpment that divide NC and SC are 2800’ to 3600’. 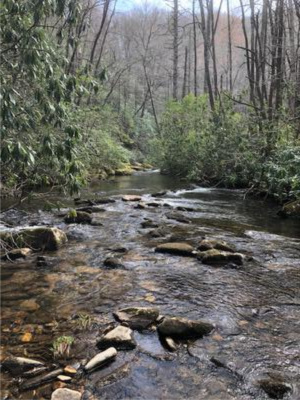 Having said that, most of my trout fishing takes place in North Carolina, where there is an embarrassment of trout stream riches. JJ - Have you gotten any of the WooDream lures? If so, have you fished them much? I would love to hear a report on them. I have slowly been adding them to my inventory of lures. I had the "courage" to fish one in Valley Creek last fall, and caught several nice cutthroat. I say "courage" because the steam has no trees to grab the lure, and it is small enough that even a hang-up on the bottom could be easily remedied. I'm going to fish them this year. Well there is one that I really like that is almost too pretty to fish. Would love to hear some stories using the WooDreams. I was fishing an Arbor 40s in the undercut banks on the creek. 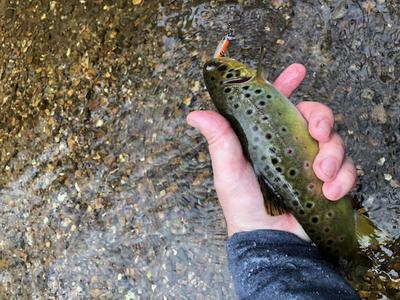 The creek was shallow enough to wade, so I would position myself so I could work the lure within 6 inches or less of the undercut, and the trout would "come out of the dark" and slam it! Lots of fun, no doubt about what was happening! Absolutely no hang-ups, and meadow grass isn't a threat to any lure! Call me a chicken, but I really don't want to lose one of these lures not only because of the cost, but they are so cool! I don’t have any of the WooDream lures......yet. I’m intending to add one to my next order. I certainly appreciate, and am willing to spend money on, quality products, but one of the voices in my head keeps telling me I might as well just toss 2 twenty dollar bills into the river. On a more serious note, I have only lost two lures in a river, and the thing that bothers me more than the monetary loss is leaving something man-made in such a pristine place. I will certainly do a post, and let you know what I think of it. Between the Daiwa, and Duo lures that Chris is currently stocking, I have been able to begin developing preferences for different waters. I’m hoping demand is enough that he can continue to expand the selection. It seems that spoon interest is strong, I’m hoping the popular BFS movement will drive some plug interest as well. I really like the 50mm length in a plug, just want to try some that are less than 4 grams, but aren’t floating. I still have plenty of experimentation to do. One of the WooDream lures that I would like to add this summer is the short, fat, 38mm Arbor. The thought of getting takes on, or near the surface with spinning gear has me almost giddy. Two things have kept me from carrying more plugs: 1) concern that sales would be too slow to justify the investment in inventory (or worse, inventory that just doesn't sell at all) and 2) the fact that the vast majority of plugs come with a pair of treble hooks, which I don't want to promote. As it is, I tape a single hook to each package of treble-hooked plugs but I'd rather carry plugs that come from the factory with single hooks. As I find single-hook plugs I will add them to the shop. They don't sell as fast as the spoons, but I am no longer as concerned as I was at first. Two new plugs will show up in another couple weeks. Thanks for the plug inventory update, I will definitely be watching. I will plan my next order around their arrival. The fact that you are conscientious about the resource we all enjoy, is one of the reasons I support this site. I have always fished for trout with single hooks, and simply bent the barb in, before barbless hooks became widely available. Now, I’m doing the same for bass, and other species I may catch. If we are doing this for sport, and are going to be releasing them, we should do everything we can to minimize any harm. I’m happy to hear that you have found some that come with singles.